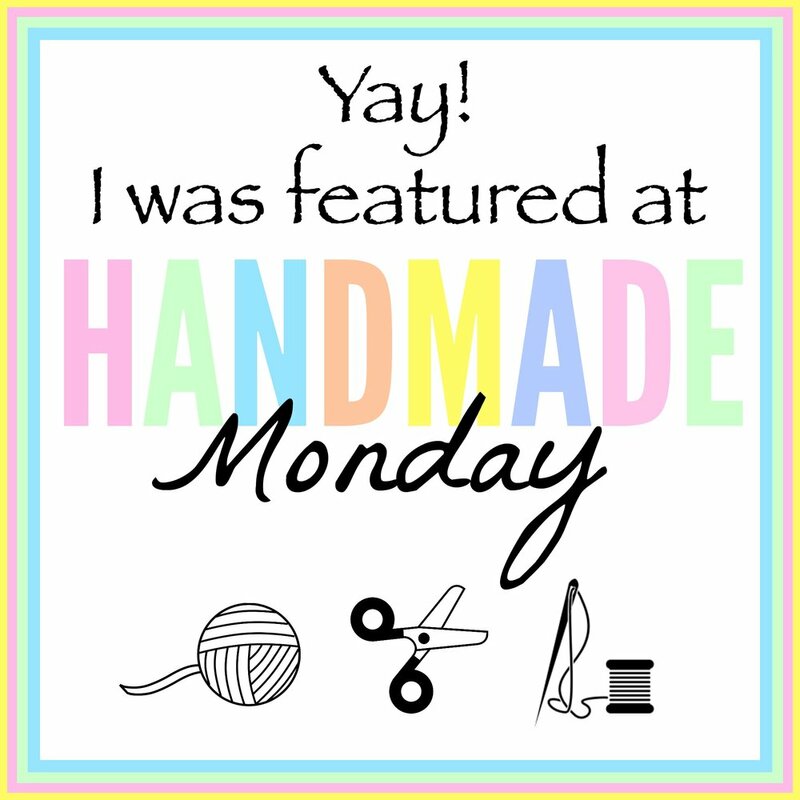 Some of you might have already noticed that little box on the top right-hand side of my blog titled 'My Handmade in Israel Shop', and I am delighted to confirm that my Etsy shop is now open for business! It is bursting with all my papercut goodies, from my cards for all occasions, to artwork and treasure boxes, and most importantly for the moment, Christmas cards for the upcoming holidays, made in the place where it all began! Please drop by to have a look and possibly make some purchases for the holidays or simply because there is something there that you love, and remember, I am always happy to hear from anybody with a special request for their own custom-made illustration or cards. A friend recently told me of a new Judaica shop in town and was kind enough to mention my name to the owner. I dropped in there last week to show him my cards. He liked them and is going to stock them in his shop. 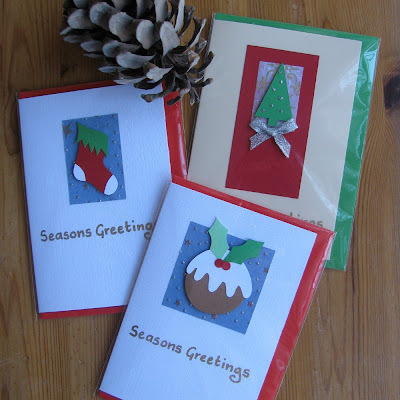 Consequently I have been busy these last few days preparing a box full of cards that are back to front! Why? Because Hebrew, and the other Semitic languages, are written and read from right to left. Books in Hebrew open in the opposite direction from books in English, and this applies to greetings cards too. Above you can see some of the designs I will soon be delivering to the shop. 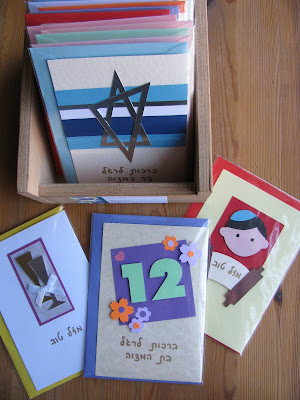 From left to right, a Mazal Tov, or congratulations card, a Batmitzvah card, and a Barmitzvah card in Hebrew, and in the box, a more traditional design for Barmitzvah card with a Magen David, or Star of David, and stripes to represent the Tallit, the Jewish prayer shawl, which a boy is obligated to wear in the synagogue from the day of his Barmitzvah and onwards. 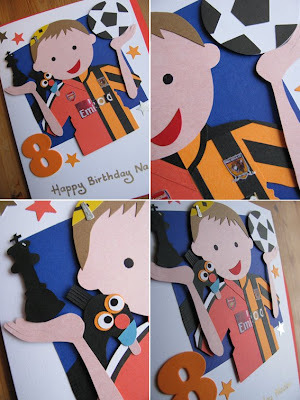 I recently showed a card that I made for my son's birthday showing him wearing a combined Arsenal and Hull City football shirt. 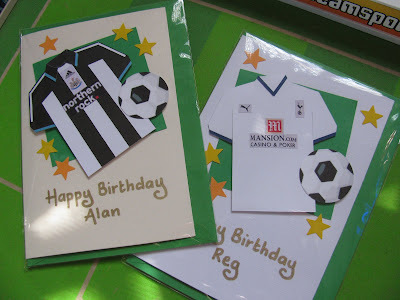 This time it was Newcastle and Tottenham cards that were requested. Top left, you can see the black and white stripes of Newcastle's 2008/9 shirt, and on the right Tottenham's white shirt. I also created another, non-football related, design for men. 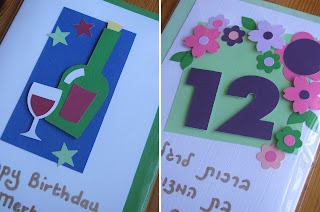 Above, you can see a new design showing a nice bottle of red wine and a glass to congratulate one of the men in your life, and on the right, a return to my more floral, feminine designs with a Batmitzvah card that was requested, in hebrew, for a girl who really loves flowers. Congratulations to all, and I hope that the best team wins! 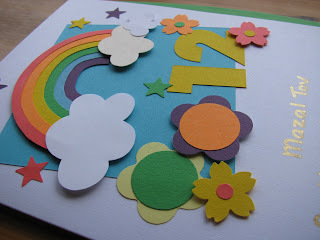 This was a truly delightful card to create. 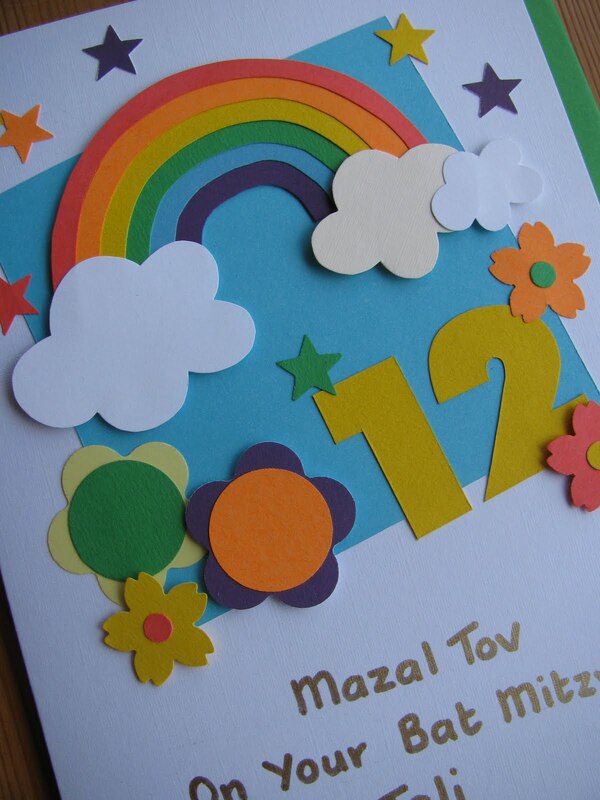 A friend's daughter recently celebrated her Batmitzvah and I was asked by a fellow guest to create a rainbow-themed card for the Batmitzvah girl, to match the theme of the celebration. It was a lot of fun to do and lovely to go a little wild with the colours! I have also been making some more pictures. These particular ones will be collected this evening and have been purchased as newborn baby gifts. 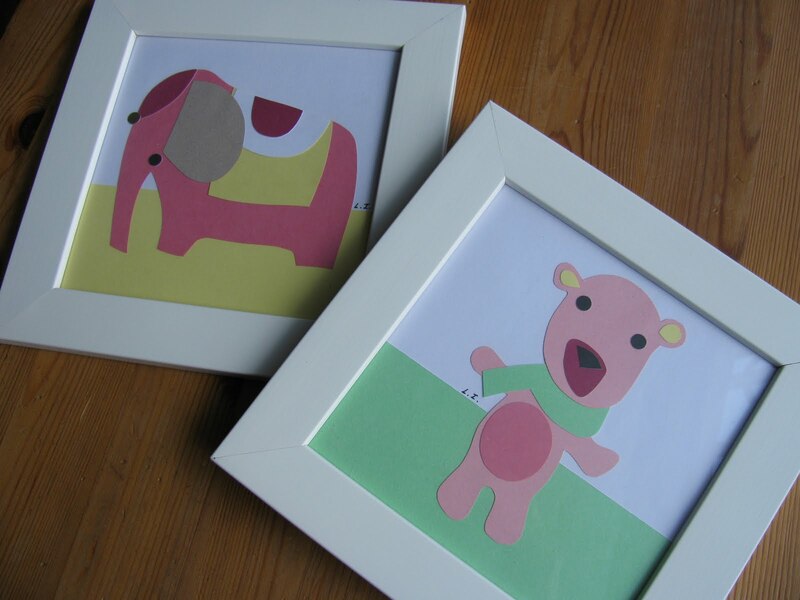 I am sure that the babies will not appreciate them, but hopefully the new mums will be pleased with a little 'Handmade in Israel' artwork for their babies rooms. The birthday celebrations are over for now (though we have another one in the not too distant future) and it's business as usual for me. I have been busy with some more custom orders. 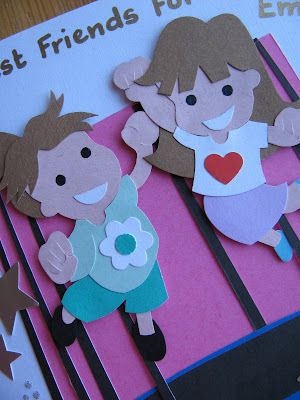 Above is a detail from a yet-to-be-delivered Batmitzvah card, so I am going to wait a little while until I show you the whole thing. A very specific design was requested - two girls bouncing on a trampoline - and it took me quite a while to work out the composition. I hope that the young lady receiving it will be happy. Below is a birthday card that I know has been received, and I believe, very much appreciated. 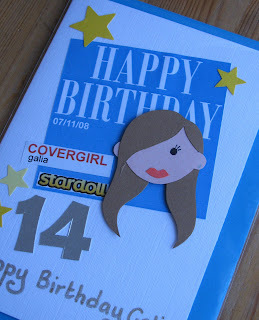 This particular teenager is very into the Stardoll website at the moment, so I made the birthday girl into a Stardoll cover girl for her big day. Happy Birthday to my wonderful 8 year old!